Anyone who knows me knows that I can be quite particular. And once I know what I like, I tend to stick with it — I’m that person who orders the same thing at a restaurant every. single. time. Every so often, though, it definitely pays off to move away from that and see the magic that can ensue. 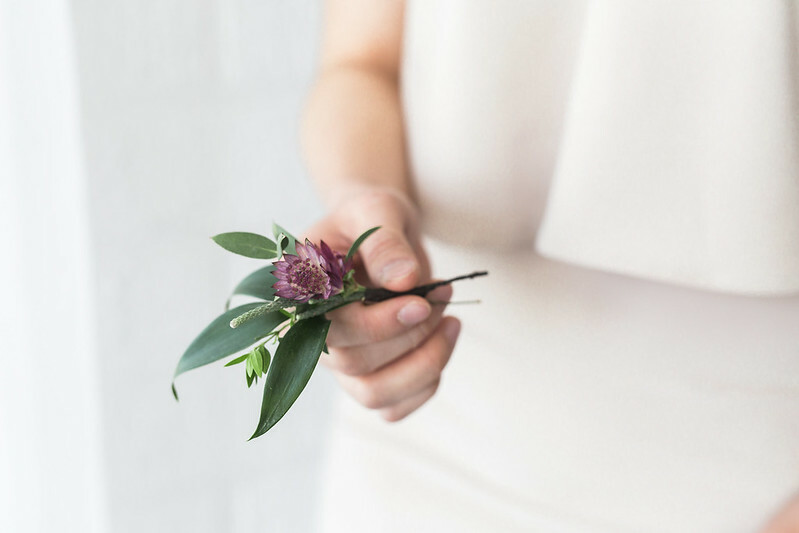 For the second piece of our three part floral bridal hair story (see look 1 here), my wedding florist Michelle created individual pins using astrantia and more Italian ruscus. 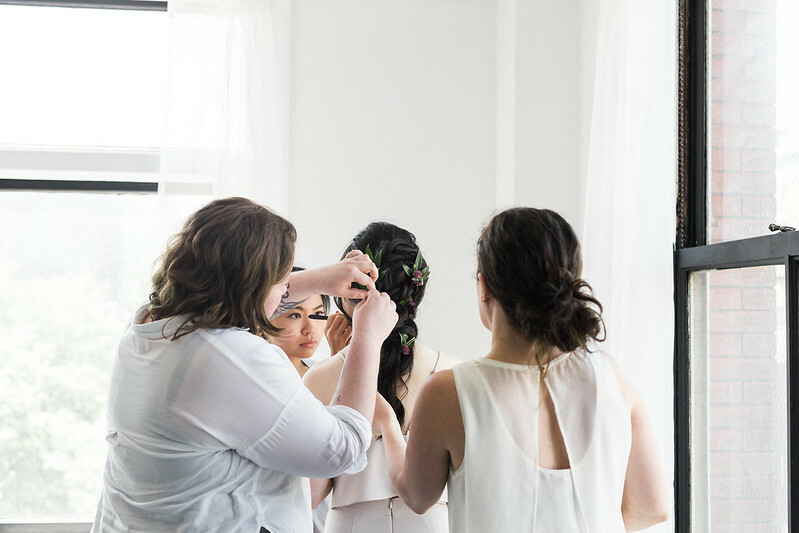 And Jen, our hairstylist, had free rein over how to incorporate them into a look. 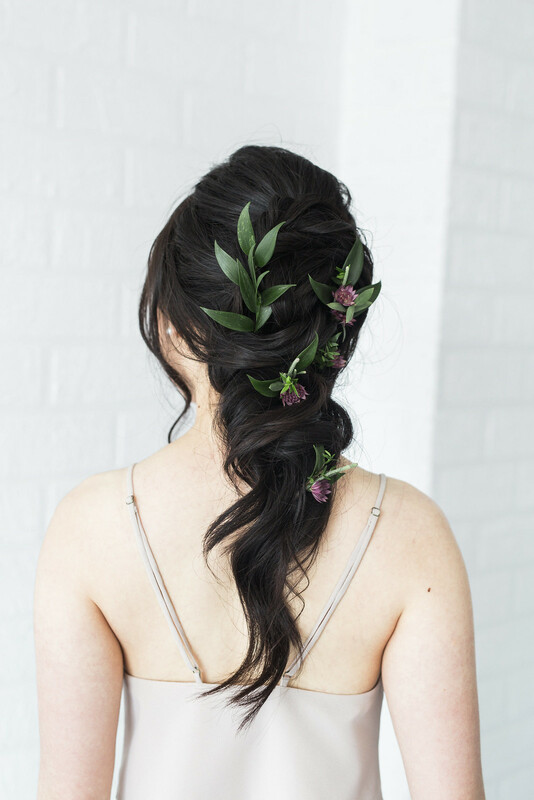 She came up with an intricate half-updo inspired by Ulyana Aster, interspersing the flowers throughout. Since the style was a little more “done” than what I’m used to, a two piece set by Park & Fifth Co was a perfect neutral canvas. And to complement the colour of the blooms, Katie Elwood‘s team created a bolder make up look with a dark lip and thick lashes. Oh my goodness! You look stunning! Thanks V – Jen Mathison has some serious talent!